When the professor of my travel writing course told us that we could choose our own subjects for our final article (provided it fell under the “travel writing umbrella”), I knew exactly what I wanted to write about: the Toronto Chocolate Festival. So after my teacher had assured me that eating chocolate always counted as research in her classes, I armed myself with notebook and camera and headed up to Toronto. The festival lasts for three weeks (from mid-October to the first week of November), with various events held throughout the period as well as several promotions that are on-going during the entire festival. One of these promotions is Chocolicious: a special coupon program that chocolate shops from all over the city participate in, posting vouchers on the festival’s website for customers to print out and then bring in and redeem. I chose the Belgian Chocolate Shop in the Beaches as my Chocolicious destination, where my coupon secured me a delicious dark chocolate truffle filled with walnut-and-hazelnut cream. Sadly, I don’t have any photos because there was nowhere to set my notebook down in the tiny shop (the lighting was pretty dim anyway), but I can assure you that the chocolates were beautiful. However, I would strongly encourage you to not just take my word for it, but to go out to see (and taste) for yourself. They use Callebaut chocolate for all their truffles; so if you are, like me, a fan of this Belgian chocolate brand, you definitely wouldn’t want to miss it. My next stop was the King Edward Hotel. 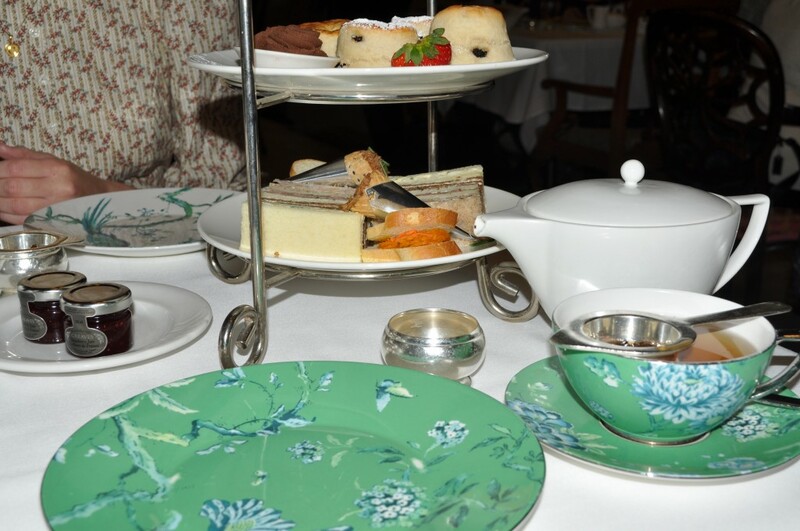 The hotel has been serving afternoon tea ever since it opened in 1903, and they were offering a special chocolate-themed tea in honor of the festival. 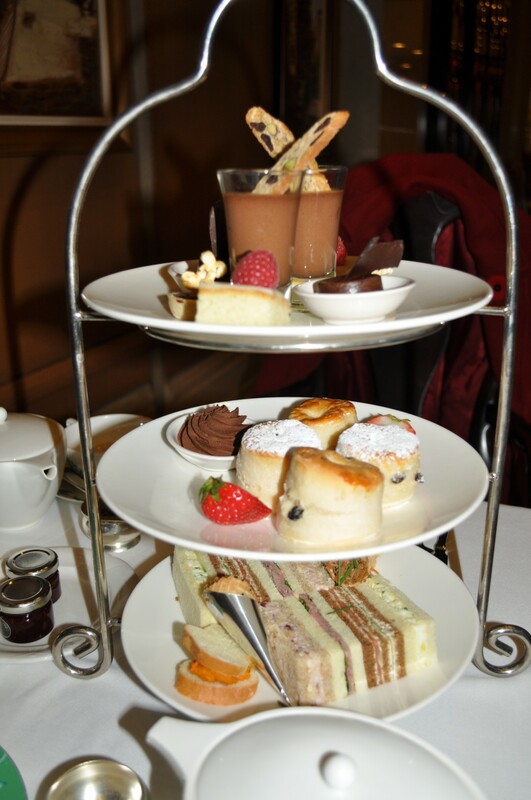 I love the tradition of afternoon tea, and the combination of it with chocolate sounded irresistible to me. The menu listed two special tea blends to choose from. They were both Ceylon black teas; but one, the “Macaroon,” was infused with cacao nibs and toasted coconut, while the other, straightforwardly called “Chocolat,” was blended with cocoa oil. Since my sister was there with me, we each selected a different one, so I was able to try both of them. The faint, toasty notes of coconut in the “Macaroon” tea blended nicely with the rich flavor of the cacao nibs; but the “Chocolat” was absolutely incredible, especially when “enjoyed with a spot of milk” as the menu urged. I found it very intriguing that the milk actually enhanced the chocolate flavor, rather than obscuring it. The hotel purchases the tea blends from a Vancouver-based company (which goes under the extremely blunt name of “T”); they mostly supply tea to luxury hotels, but they also do have retail. If you like tea, do take a peek at their website. And afternoon tea cannot be eaten without scones. The King Edward’s scones are still made from a recipe that former head chef Jan Higgins brought over from England in the 1970s (he worked at Buckingham Palace before coming to Canada). Sadly, I found them rather bland, though very light and fluffy. The usual pot of clotted cream was not offered alongside, but a lovely hazelnut ganache spread instead. 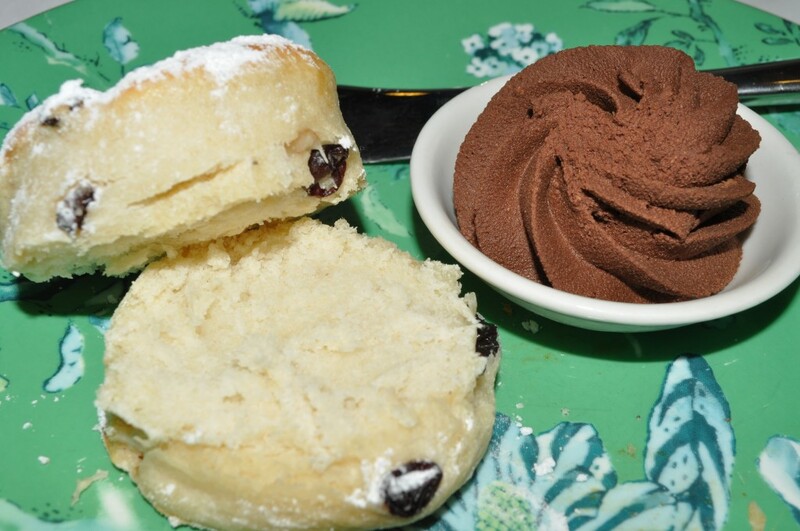 I wonder why I never thought of putting chocolate on a scone before. Marvelous. It tasted particularly good in combination with a thin layer of strawberry jam. Ah, and then the final tier. 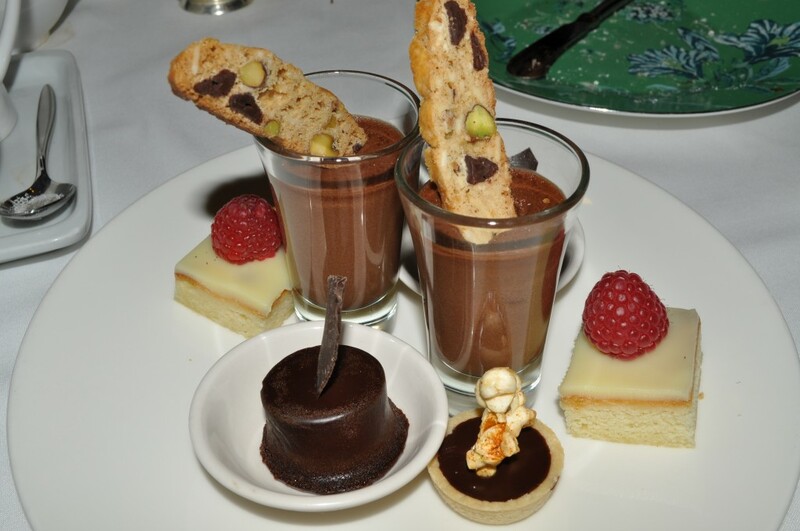 Here the chocolate really took center stage. There was the ubiquitous flourless chocolate cake (tasted like a brownie, but the texture was a cross between a truffle and a custard), a “pave of intense white chocolate” which my sister adored, a heavenly chocolate and salted-caramel tart, and a sliver of chocolate chunk-pistachio biscotti (that wasn’t anything special, but certainly added drama to the presentation). However, my favorite was the “chocolate-espresso shooter.” When I read it on the menu, I was slightly puzzled as to what it was going to be. It turned out to be a shot glass filled with ethereally light chocolate-espresso mousse. I was amazed by the deep chocolate flavor that was achieved in such an airy confection, but somehow the tandem of coffee and chocolate works together mysteriously to fortify chocolate flavor. Two days after this chocolate extravaganza, on November 4th, the final day of the festival, my mother and I came back up to Toronto to attend the Luxury Chocolate Show. 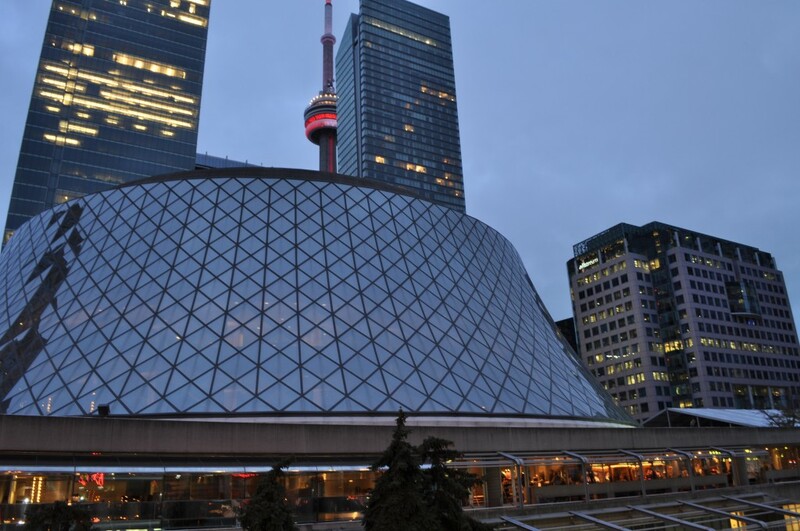 The show, held in the glamorous lobby of Roy Thomson Hall, was a congregation of chocolate artists, vendors, and aficionados from all over the city—and the world. And since almost every booth was offering some kind of sample, we had a perfectly delicious time, as you might imagine. (And isn’t the hall just beautiful?) I wish I could tell you about all the vendors I met and chocolates I tried, but this post is already far too long. So I will confine myself to my two favorites. 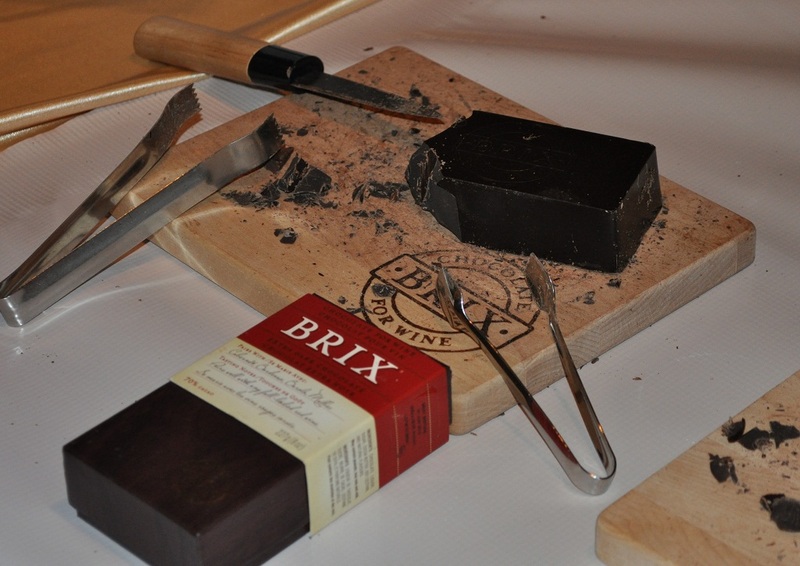 The most interesting vendor was Brix Chocolate. 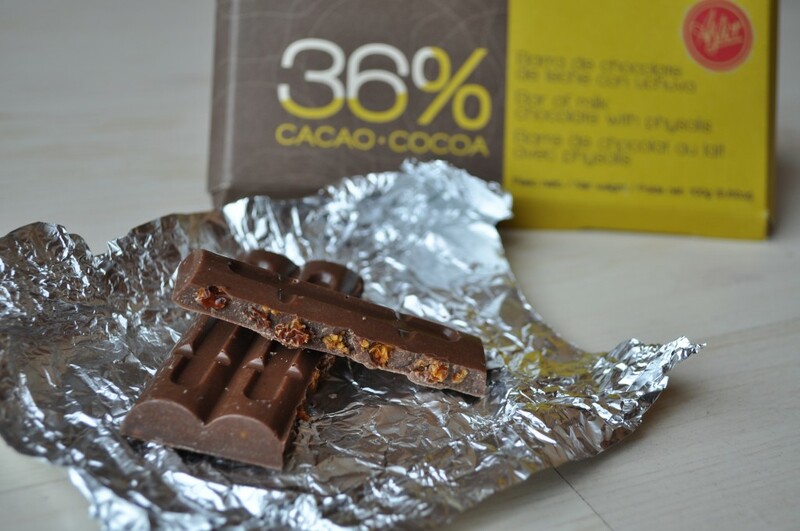 They develop chocolate bars to pair with wine, touting them as a healthier alternative to cheese. Their 70% dark chocolate was particularly amazing. It is specially blended to leave no aftertaste; “because you can’t spoil your palate when you’re tasting wine,” as the attendant at their booth explained to me. Most high-percentage chocolates have fairly acrid finishes, so I was skeptical when I first tasted it. But the bar, although it retained the depth and power of an ordinary 70% chocolate, was without a trace of bitterness. I don’t know how they do it, but it’s amazing! However, my real discovery came at the most understated booth at the show. 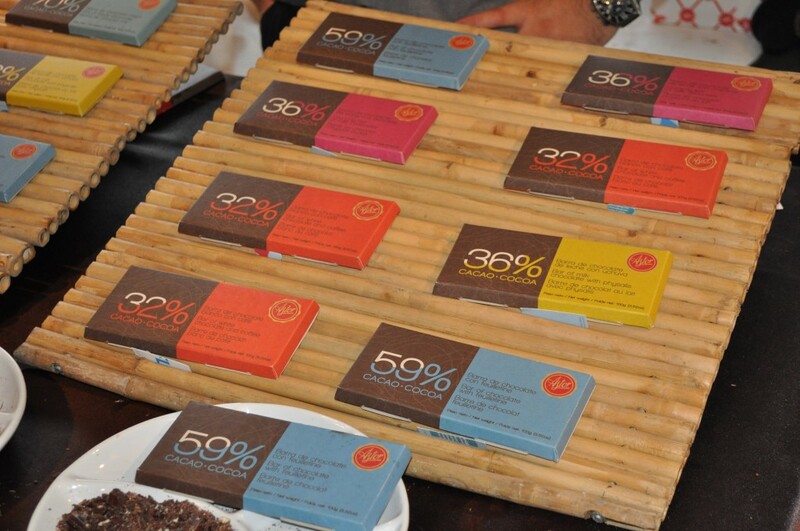 There were no fancifully molded truffles or glitzy packaging at this table, just five types of chocolate bars, in unpretentious, matte-finish wrappings made from recycled paper, simply laid out on bamboo trays. But the three Columbian men behind the table had piled generous chunks of each bar onto white plates and were offering samples to the crowd with unstinted enthusiasm and evident pride. Five samples instead of one naturally made the booth quite popular, so I had to stand in line for my turn to taste the chocolate. 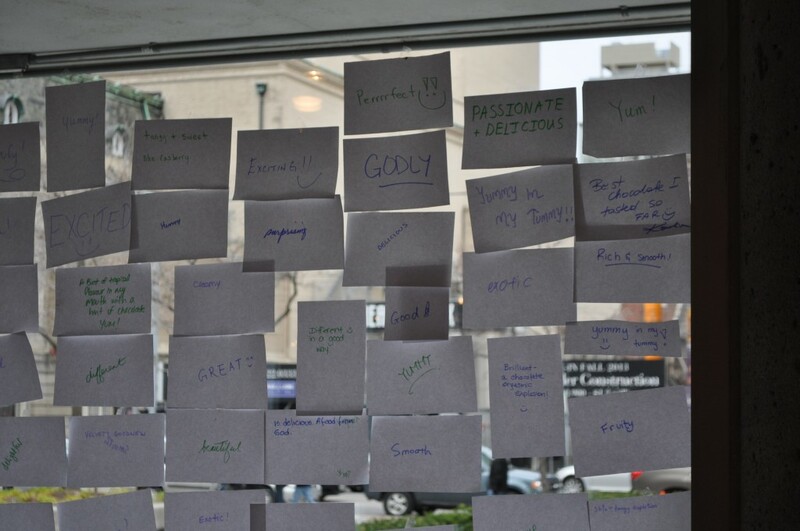 While I was waiting, I amused myself by reading the bits of paper that were plastered up on the window behind the booth, the praises left by earlier customers. When I finally reached the table, I learned that the men were representatives from Flo Trading, an importer of Latin and South American goods, and that their product was the chocolate of El Astor, a popular bakery and confectionary shop in Medellin, Columbia. The original store (there are now seven locations throughout Medellin) was opened by Swiss immigrants in 1930. The philosophy behind these bars is to combine Columbian chocolate with other local specialties such as bananas and coffee, to highlight the region’s native ingredients. I thought the concept was interesting, and the chocolate was divine. I tried all five samples, and especially loved the white chocolate-espresso bar: as the sweet, creamy white chocolate melts away, it leaves behind gritty flecks of coffee beans, startling bits of dark, roasted flavor. The contrast works perfectly. 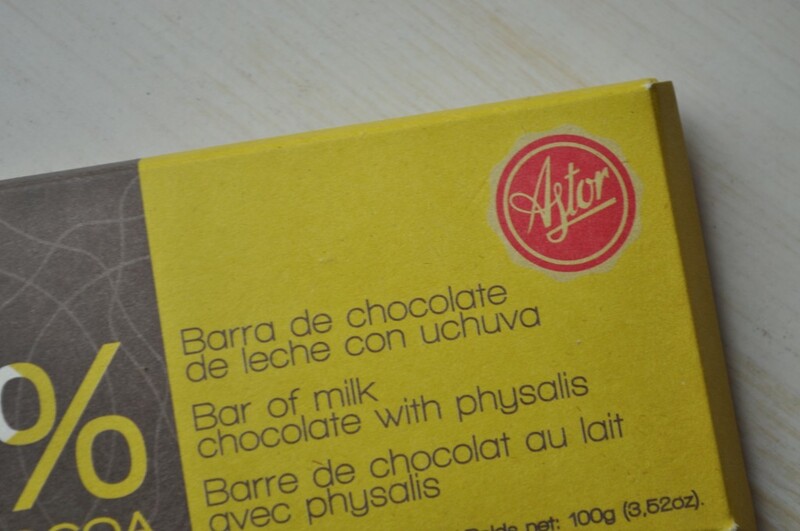 But my favorite bar (and the one I ended up buying) was a milk chocolate bar studded with dried uchuva—a golden berry grown only in Peru, Ecuador, and Colombia. The sweetness of the berries reminded me of raisins, but the uchuva also had a slight sourness and an exotic hint of spice. And that was the experience that I had hoped to find at the Chocolate Festival; I wanted to discover something completely unknown and foreign through the familiar taste of chocolate. I would have to call the entire experience a resounding success. If only all school assignments were such fun.